Did you enjoy the weekend? It was what summer is made of... blazing sun, soft breezes, and temps high enough to melt your ice cream cone. We managed to escape to my sister's pool and spent a bit of time by the shores of Georgian Bay as well - in between painting and grouting, of course! I have one more day of painting ahead of me but the basement is already looking and feeling lighter, brighter, and more finished. Oh, the power of white paint!! I've always known we would paint the basement white, but finding the right white, well that was a lot more difficult than I thought it would be. See this? These were all the paint samples (all from Para Paints) I tried out on the road to find the perfect white (oh, and one accent colour too). I tried the Chrysler Hall White which Janice used in her hallway but it looked too blue on my wall. 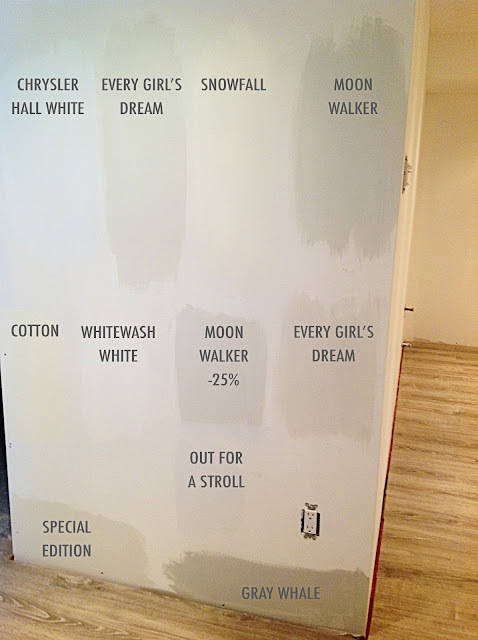 I tried Snowfall, which is Sarah Richardson's favourite trim colour, but it was too creamy. Other colours looked too gray or too purple, too beigey or taupey. I resorted to going to Lowe's with a sample of my flooring in hand and picking out a paint under the harsh fluorescent store lights. That paint was Every Girl's Dream... which, with the paint chip laying horizontal against my floor sample, looked like a nice warm white... and which, painted on my vertical wall looked like a creamy cafe au lait. Note to self: look at paint chips vertically! Which brings up an important point: its always best to pick your paint 'in situ'. Paint a sample on the wall it will go on, under the lights that will be overhead. Nothing looks the same in store; nothing looks the same on the 2"x2" paint chip. I finally did pick my paint colours. Now I just have to get all the painting done! Do you try out paint samples before you buy? Have you had any paint choice disasters? I once painted a dining room wall red and found I couldn't live with it. Three days later, I repainted it blue! I've finally started doing this - I used to just look at a paint chip in the store, grab a gallon and go...and it always turned out terrible. We used Whitewash White for the ceiling (and eventually it'll be on the trim, too) in our bathroom. The walls are SR's Vintage. I really like Para's Empire Grey and Lunenburg as well.